This is one concert you do not want to miss! Itzhak Perlman is returning to Vancouver for this first time in 6 years. 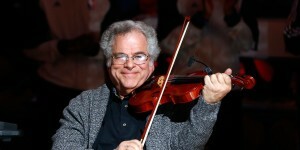 Perlman, now 70, has been playing the violin since age 3. Born in Tel Aviv in 1945 to Polish parents that immigrated to Palestine in the mid-1930’s, young Perlman became interested in the violin after hearing a classical performance on the radio. Too small to hold a violin, he started teaching himself on a toy fiddle. At age 4, Perlman contracted polio which has left him with weak legs and requires that he use crutches or an electric scooter for mobility. While many violinists move about the stage when they perform, Mr. Perlman sits while he plays. Perlman preformed his first recital at age 10 in Tel Aviv before moving to the United states to study at the Juilliard School in New York City. His appearance on the Ed Sullivan show in 1958 was his first introduction to an American audience. The Ed Sullivan show was a favourite in my family, so now as I write this I wonder if I was witness to this performance. While primarily known as a classical music solo performer, Perlman has been a soloist for a number of film scores including Schindler’s List and Memories of a Geisha. Recently Perlman began conducting and is the principle guest conductor with the Detroit Philharmonic Orchestra. In 1995, Perlman along with his wife Toby, also a concert violinist and Suki Sandler, started The Perlman music program for exceptional string musicians between 11 – 18 years of age. Perlman is well known for sharing his knowledge and love of music both within a formal class room setting and to music lovers of all ages. Itzhak Perlman is one of great musicians of our time and one that you should definitely make the time to see. So start your New Year off right and join us for this great concert.